Scottish-born German pianist and composer. Fine signed and inscribed cabinet photograph “für P. Redl zur freundlichen Erinnerung an Eugen d’Albert”. 4.25 x 6.5 inch. Wien, 1917 February 21. Photo by C. Brasch, Berlin. Inscribed to Paul Redl, répétiteur and later dirigent of the Vienna State Opera. Mounting residue on verso, else fine condition. Uncommon in signed photographs. American-born French dancer, singer and actress. Vintage signed photograph “Love you Josephine Baker 1973”. 8.0 x 10.0 inch, n.p., 1973. The imaged depicting Baker in a half-length pose in costume as Zazou Clairon from the comedy film The French Way (1945). Signed in blue ink to a clear area of the image. With a horizontal crease to the centre of the image, and a small crease to the lower left corner, else good condition. American-born French dancer, singer and actress. Signature “Josephine Baker”. 1p., piece of paper with “China” printed in the upper left corner, 7.25 x 4.7.5 inch. 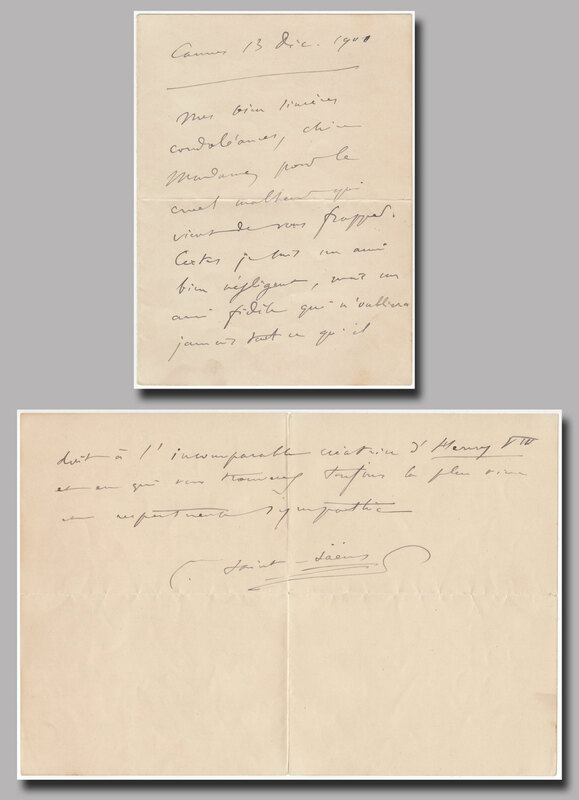 Additional salutation in Baker’s hand: “Avec mes meilleurs souvenir” and dated by her “1946”. Handsomely matted in green with a photograph to an overall of 8.25 x 11.5 inch. Good condition. Hungarian composer and pianist. He is considered one of the most important composers of the 20th century. Ink signature “Béla Bartók”. 4.75 x 3.5 inch, probably a page from an autograph album, n.p., n.d. Handsomely matted in gray with a photograph of Bartók to an overall of 7.75 x 11.75 inch. Excellent condition. Both items removable affixed with photo corners. Greek-American soprano, and one of the most renowned and influential opera singers of the 20th century. Large vintage signed photograph, probably from a concert program. 9.75 x 8.5 inch, n.p., n.d. Signed in ballpoint pen “Maria Callas”. Excellent condition. Verso shows a photograph of tenor Giuseppe di Stefano. World renowned Italian tenor usually considered the greatest operatic tenor ever, and he was the first opera star to make best-selling recordings, beginning around 1903, which are still in print to this day. Signed ink drawing “Enrico Caruso”. 5.75 x 7.25 inch sheet from an album page, n.p., n.d. (about 1913/1914), black ink. Next to his signature Caruso added a beautiful caricature of himself. Slightly discolored, else good condition. Surely one of the finest Caruso drawings you can hope to find, especially in ink and not in the more common pencil. World renowned Italian tenor usually considered the greatest operatic tenor ever, and he was the first opera star to make best-selling recordings, beginning around 1903, which are still in print to this day. Desirable and uncommon cabinet-photograph signed “Enrico Caruso”. 4.0 x 6.25 inch, Berlin 1906. Signed and inscribed in French with a date of Berlin 1906. Published by T. Massak of Prague. Mounted to a same size piece of paper, else fine. Unusual, Caruso is more common in signed postcard-photos. 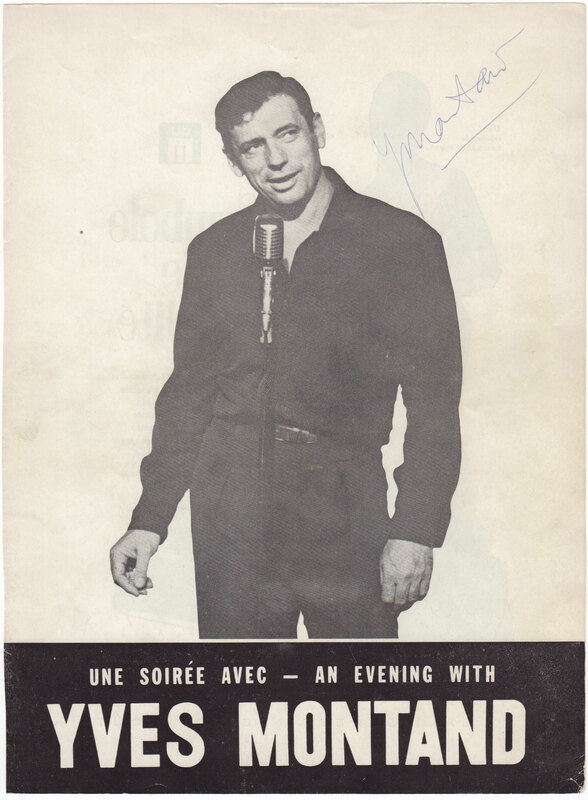 French actor, cabaret singer and entertainer. Vintage signed photograph, probably from a concert program. 8.75 x 12.0 inch, n.p., n.d. 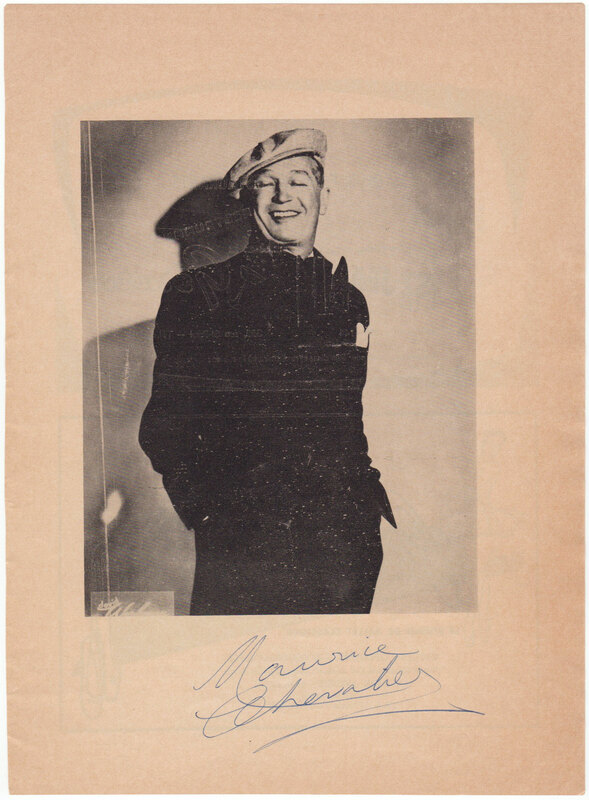 Signed in ballpoint pen “Maurice Chevalier”. Left border trimmed, slightly discolored, minor handling wear, else good condition. Norwegian composer and pianist. He is widely considered one of the leading Romantic era composers, and his music is part of the standard classical repertoire worldwide. Postcard photograph signed “Edvard Grieg” and dated in his hand “München (Munich) 6/4 07”. 3.5 x 5.5 inch, Munich 1907 April 6 (postmark and written by Grieg). Artist lithograph - Heinrich Kley (1863-1945): Munich, view of the Maximilianeum. Fine condition. His last concerts were played by Grieg in 1907 (Oslo, Copenhagen, Munich, Berlin and Kiel). A fine and rare document from his year of death. Italian composer, best known for his operas, particularly the beloved repertoire staple “Pagliacci” (1892). Signed cabinet-photo “R. Leoncavallo”. 4.25 x 6.5 inch, Budapest, 1897 December 2. Photo by E. Bieber, Berlin-Hamburg. Inscribed by Leoncavallo in dark ink "All'ottimo amico Andrea Merkler cordialmente offre" and dated "Budapest 2 Dicembre 1897" in his hand. Handling wear, discolored, but still a beautiful signed photo and with a rare image. Hungarian Romantic era composer, virtuoso pianist and conductor. His prowess at the keyboard earned him a reputation as perhaps the greatest virtuoso in the history of the instrument. Signed and inscribed cabinet photograph “F. Liszt”. 4.25 x 6.25 inch. Weimar, date illegible. Photo by Louis Held in Weimar. Dedicated in Liszt’s hand “Meiner lieben Pauline von der Altenburg bis zur Hofgärtnerei…” Writing slightly faded, photograph with handling wear, else good condition. Pauline (Pauline Apel) was for thirty years the housekeeper of Liszt. When Liszt's residence, the “Hofgärtnerei”, in Weimar became a museum approximately one year after his death P. Apel became the official tourist guide. She remained there in this capacity until her in death in 1926 at the age of eighty-eight. Affordable priced and with fine association. Hungarian Romantic era composer, virtuoso pianist and conductor. His prowess at the keyboard earned him a reputation as perhaps the greatest virtuoso in the history of the instrument. Autographed letter signed “F. Liszt”. 1p., (double-page), 4.0 x 6.25 inch. N.p. (Weimar), n.d. Monday (1878 June 2). To his friend, the lawyer, Carl Gille in Jena. In German, in full: “Verehrter lieber Freund, Betrübt von Deinem Leiden, hofft baldige Besserung, und sagt Dir herzlichst auf Wiedersehen in Wiesbaden. Dein alter getreuer. Morgen Abend bin ich in Wiesbaden, und kehre Montag hier zurück. Gruss an den lieben Sekretär Jenny.” Translated: “I am saddened by your sufferings, hoping for a speedy recovery, see you in Wiesbaden. I'll be in Wiesbaden tomorrow evening, and I'll be back here on Monday. Greetings to the dear secretary Jenny”. Mailing fold, else fine condition. Hungarian Romantic era composer, virtuoso pianist and conductor. His prowess at the keyboard earned him a reputation as perhaps the greatest virtuoso in the history of the instrument. Autograph letter signed “F. Liszt”. 1p., visiting card, 2.75 x 4.5 inch, n.p., n.d. Short autograph letter signed on his personal visiting card with printed „F. Liszt” in the middle. In German, in full: “Hochgeehrter Freund, Empfangen Sie freundlichst Herrn Baumeister, ein liebenswürdig ausgezeichneter Künstler, ergebenst.” Translated: "Dear friend. Please welcome Mr. Baumeister, a graciously honored artist.” Fine condition. Hungarian Romantic era composer, virtuoso pianist and conductor. His prowess at the keyboard earned him a reputation as perhaps the greatest virtuoso in the history of the instrument. Autographed envelope matted “Herrn Justizrath Dr. Gille in Jena”. 4.25 x 3.5 inch, n.p., 1878 March 26 (postmark). Addressed in dark black ink by Liszt. Handsomely matted in gray with a photograph of Liszt to an overall of 7.75 x 11.75 inch. Both items removable affixed with photo corners. Fine condition. Italian composer whose 1890 masterpiece Cavalleria Rusticana takes a place among the most beloved staples of the operatic repertoire. Autograph musical quotation signed “P. Mascagni”. 1p., 4.5 x 3.25 inch (visible), Rome, (1)901 January 23. Mascagni pens some bars of unidentified music. Handsomely matted in gray with a photograph of Mascagni to an overall of 7.75 x 11.75 inch. Both items removable affixed with photo corners. Fine condition. German opera composer who has been described as perhaps the most successful stage composer of the nineteenth century. 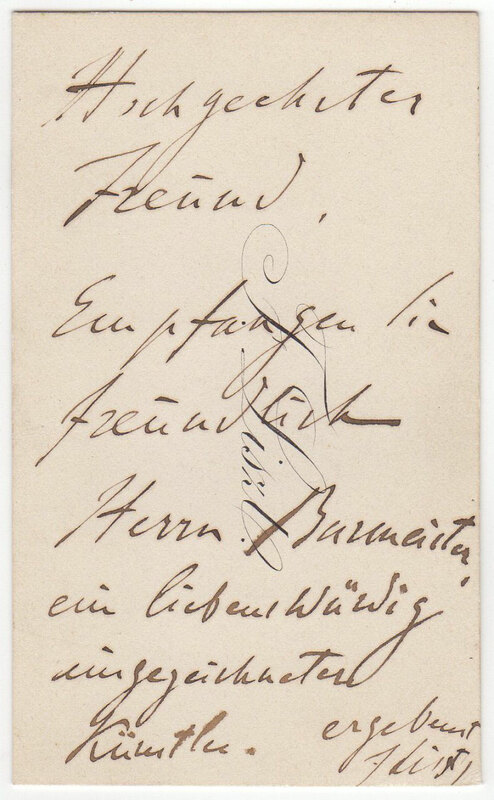 Autograph letter signed “Meyerbeer”. 1p. (bifolium), 5.25 x 8.5 inch, n.p., n.d. (Lundi = monday). 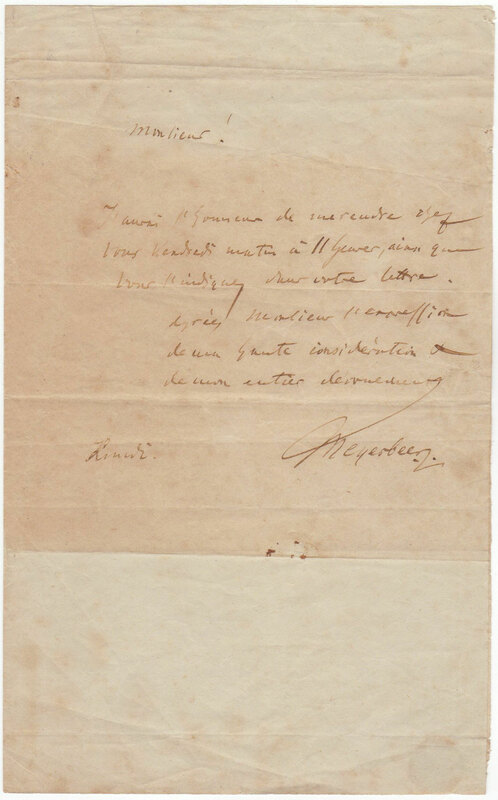 Addressed on recto in Meyerbeer’s hand to the Politician and playwright Charles Guillaume Étienne (1777-1845) - member Académie francaise. In French, Meyerbeer writes that he will accept Étienne’s invitation for the coming Friday morning. Discolored, handling wear, else good condition. German composer, pianist, organist and conductor of the early Romantic period. Address panel, 1p., 4.25 x 4.5 inch (visible), Frankfurt, 1845 August 8 (date of the accompanying letter, but not included). Addressed in his hand to violinist and composer W. Speyer. Additional in Mendelssohn Bartholdy’s hand in German: "Hierbei auch der Kinderfreund mit bestem Dank" (Here also the “Kinderfreund” with thanks). Among the various books and magazines of this title Mendelssohn Bartholdy probably refers to Friedrich Philipp Wilmsens book "Der deutsche Kinderfreund". Handsomely matted in gray with a photograph of Mendelssohn Bartholdy to an overall of 7.75 x 11.75 inch. Address panel shows minor paper loss at the left edge, else fine condition. A photocopy of the accompanying letter is included. Italian-French actor and singer. Vintage signed photograph, probably from a concert program. 8.75 x 12.0 inch, n.p., n.d. Signed in ballpoint pen “YMontand”. Left border trimmed, minor handling wear, else good condition. Hungarian conductor. Fine signed postcard photograph “Arthur Nikisch”. 3.5 x 5.5 inch, n.p., n.d. Signed in dark black ink. Fine condition. French composer best known for his popular stage works, most notably Orpheus in the Underworld (including the famous “Can-Can”) and The Tales of Hoffmann. Autograph letter signed “Jacques Offenbach”. 1p. (bifolium), on “Theatre Des Bouffes Parisiens” stationery. Paris, n.d. 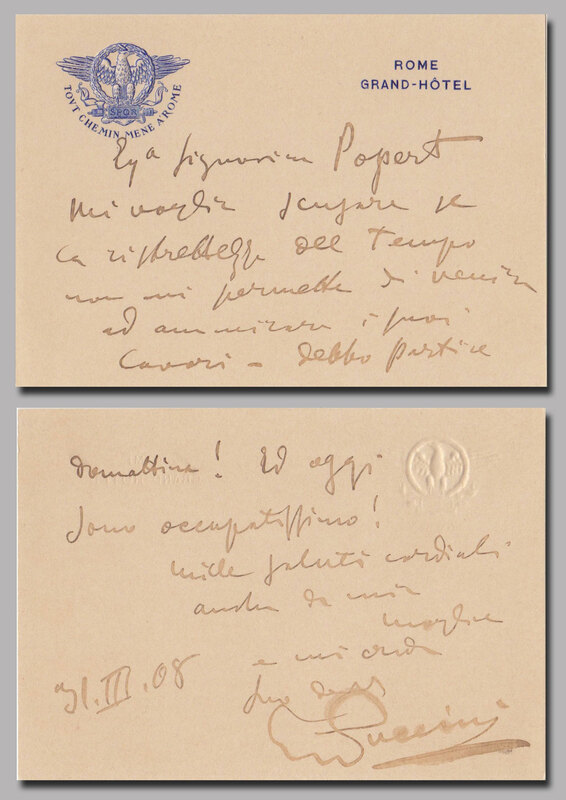 Addressed on verso by Offenbach to Monsieur Perrin. In French, untranslated. Mailing folds, else fine condition. Excellent full signature. French cabaret singer, songwriter, actress and one of France's greatest international stars. Signed souvenir “Edith Piaf”. 3.25 x 1.5 inch, n.p., n.d. Signed in dark ballpoint pen. Handsomely matted in gray with a photograph of Piaf to an overall of 7.75 x 11.75 inch. Both items removable affixed with photo corners. Fine condition. Italian composer whose operas are among the important operas played as standards. Autograph letter signed “Giacomo Puccini”. 5.0 x 3.5 inch card, Rome (Grand-Hotel), 1908 March 31. Fine embossed eagle at the top of the card. To the painter Charlotte Popert (1848-1922), who lives in Rome and who had invited him to her studio. In Italian, in full: “Mi voglio scusare se la ristrettezza del tempo non mi permette di venire ad ammirare I suoi lavori – debbo partire domattina! Ed oggi sono occupatissimo!...”. In fine condition. A letter from the violinist Teresina Tua (1866-1956), also directed to Charlotte Popert, Rome 1913 (thanks for "la deliziosa Madonnina") is included. Italian composer whose operas are among the important operas played as standards. Autograph postcard signed “Giacomo Puccini”. 5.5 x 3.5 inch. Milano, date illegible (postmark). Addressed to Felice Franceschini in Lucca. 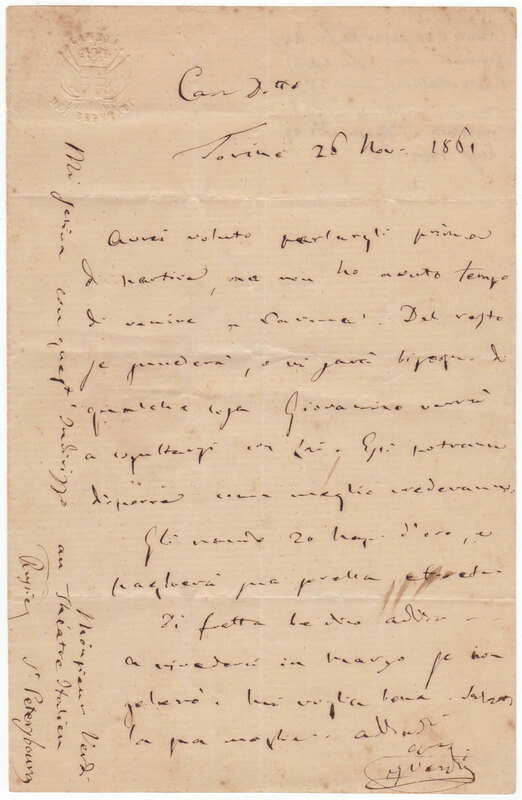 An untranslated letter in Italian in which Puccini thanks him for his letter. Also included is an unsigned G. Puccini postcard photograph. Fine condition. French composer, pianist and conductor. He liked to experiment with musical form, as in his best-known work, Boléro (1928). Autograph letter signed “Maurice Ravel”. 1p., 5.75 8.75 inch, n.p., n.d. Written in pencil, an untranslated letter in French. Ravel assured its participation in the mishap of a friend. Mailing folds, small tears repaired on verso, slightly soiled, else good condition. Scarce! French composer, pianist and conductor. He liked to experiment with musical form, as in his best-known work, Boléro (1928). Autograph letter signed “Maurice Ravel”. 1p., 8.25 x 10.25 inch, no date but circa 1916, in French. Unusual letter to the wife of French flautist Louis Fleury, in which Ravel lists the names of several friends and family members whom he would like to forward concert tickets, adding their respective addresses along the right side. Names include: “M & Mde. Leo Sachs”, “Robert Schmitz”, “M. Gaston Selz”, “M. Georges Soulie de Morant”, “M & Madame X. C. Godebski”, “Blaque–Belair”, and “M. Frederic leVillain”. Ravel adds his own name near the bottom before completing the list, “Eduoard Ravel” and “M & Mde. Bonnet”. Fragile and in very good to fine condition, with small areas of paper loss. Italian composer. His best-known operas include the Italian comedies “Il barbiere di Siviglia” (The Barber of Seville). Autographed letter signed “G. Rossini”. 1p., 5.75 x 8.0 inch. Bologna, 1838 December 26. To Emilio Belgioioso recommending a fine young composer and singing master Maestro Ostotti. In Italian, in full: “Carissimo Emilio Il giovine Maestro Ostotti ti consegnerà la presente. Egli è buono compositore, accompagnatore e precettor di canto. Tu devi fare la sua fortuna come hai fatta quella di tanti attori, da bravo proteggi il mio raccomandato, proponilo a tutte le sedi, fallo comporre qualcosa per te, canta la sua musica giova q questo interessante artista e sia certo obligherai oltremondo l’antico e costante tuo amico.” Translated: “Dearest Emilio Young maestro Ostotti is the bearer of this letter. He is a good composer, accompanist, and singing teacher. You have to make his fortune as you have made the fortune of so many actors, be good and protect my protégé, propose him everywhere, have him compose something for you, sing his music be helpful to this interesting artist and be sure you will oblige immensely the old and constant friend of yours.” Mailing folds, else fine condition. Italian composer. His best-known operas include the Italian comedies “Il barbiere di Siviglia” (The Barber of Seville). Autographed envelope matted. 5.5 x 3.75 inch, Bologna, 1838. Addressed in dark black ink by Rossini: “Al Nobil uomo Il Sr. Principe Emilio Belgioioso Celebra Dilettante di Musica, Parigi”. Translated: “To the nobleman Signor Prince Emilio Belgioioso Famous music dilettante, Paris”. Handsomely matted in gray with a vintage card de visite photo of Rossini to an overall of 7.75 x 11.75 inch. Both items removable affixed with photo corners. Fine condition. Russian pianist, composer and conductor. Autograph letter signed “Ant Rubinstein”. 1p. (double-page), 5.25 x 8.25 inch. N.p., n.d. To an unnamed countess regarding the cancellation of an appointment. In German: “Musikalische Hindernisse machen es mir leider ganz unmöglich Sie morgen bei mir zu Tische zu sehen. … Auch bitte ich Sie dasselbe Frau von Bülow wissen zu lassen deren Adresse ich nicht weiß - ein Wort Antwort erbitte ich und auch Verzeihung! Aber ‘musique oblige’”. Mailing folds, else fine condition. Autograph letter signed re: his opera Henry VIII. French composer, organist, conductor and pianist of the Romantic era. His best-known works include the opera Samson and Delilah (1877) and The Carnival of the Animals (1886). Fine autograph letter signed “C. Saint-Saens”. 3pp., (bifolium), 5.0 x 6.5 inch, Cannes, 1901 December 13, in French to a lady. Starts with condolences and ends with the words that he will not forget all that he owes to his incomparable creation of Henry VIII. Mailing folds, handling wear, else good condition. Henry VIII. is an opera in four acts by Saint-Saëns with its first performance on 5 March 1883 at the Académie Nationale de Musique. Signed program “DShostakovich”. 1p., 8.25 x 11.75 inch, Prague 1947 May 26, signed in blue ink. Program from his concert at the Rudolfinum in Prague during the Prague Spring and signed on the Cyrillic part of the program. Additional signed by the other contributors, the Russian violinist David Oistrach (1908-1974) and the Czech cellist Miloš Sádlo (1912-2003). Rare signature combination. Finnish composer and violinist of the late Romantic and early-modern periods. He is widely recognized as his country's greatest composer. Typed letter signed “Jean Sibelius”. 1p. (bifolium), 5.75 x 8.25 inch, Järvenpää, 1949 December 30. Signed in pencil. To Miss Katharine Cornell. 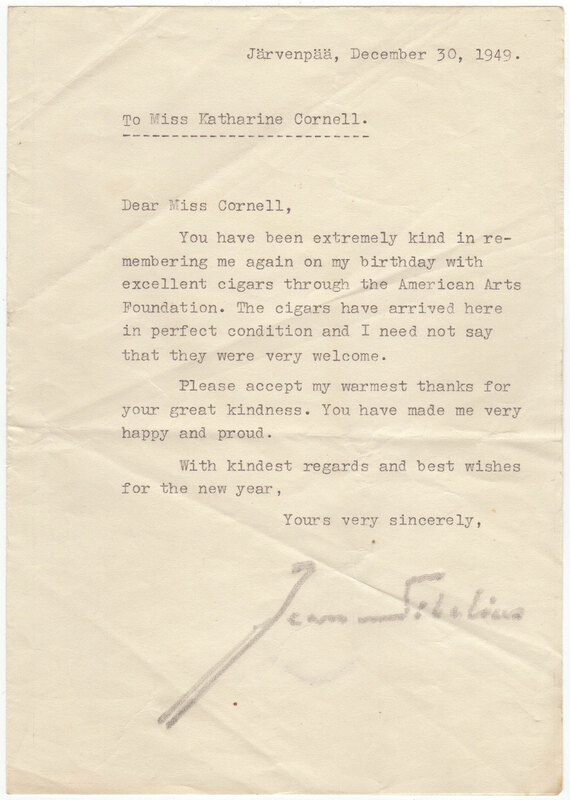 In full: “You have been extremely kind in remembering me again on my birthday with excellent cigars through the American Arts Foundation. The cigars have arrived here in perfect condition and I need not say that they were very welcome. Please accept my warmest thanks for your great kindness. You have made me very happy and proud. With kindest regards and best wishes for the new year.” Mailing folds, handling wear, else good condition. Finnish composer and violinist of the late Romantic and early-modern periods. He is widely recognized as his country's greatest composer. Album page signed “Jean Sibelius”. 1p., 5.0 x 3.5 inch, n.p., n.d., signed in pencil. Handsomely matted in gray with a photograph of Sibelius to an overall of 7.75 x 11.75 inch. Both items removable affixed with photo corners. Fine condition. American composer and conductor of the late Romantic era, known primarily for American military and patriotic marches. Because of his mastery of march composition, he is known as "The March King". Vintage signed photograph “John Philip Sousa 1905”. 3.25 x 5.5 inch, n.p., n.d. Signed by Sousa in dark black in the upper right corner. Handling and corner wear, else good condition. Italian opera composer and conductor. Excellent and unusual autograph letter signed “Spontini”. 1p., 8.25 x 10.25 inch, Berlin, 1831 June 26. In French. 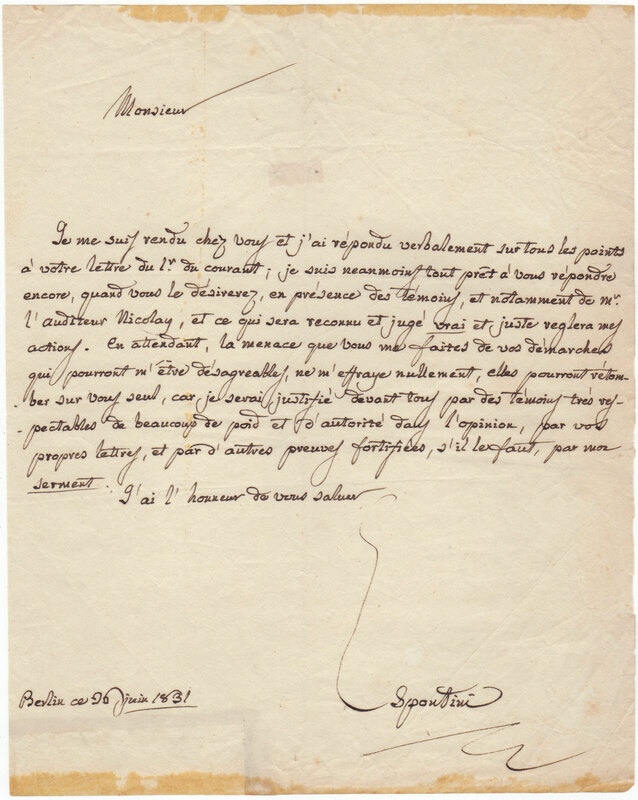 A cleanly written letter in bold black ink by Spontini, stating in part: “I have visited you and have verbally responded to all your letter points, I am however ready to answer again whenever you wish so in presence of witnesses…In the meantime your threat do not frighten me at all, they can return to you...” Spontini concludes explaining that his witnesses are many and most respectable and important people. With small traces from previous affixing to the upper and lower edges, not affecting the text nor the signature. Richard Georg Strauss was a leading German composer of the late Romantic and early modern eras. He is known for his operas, which include “Der Rosenkavalier” and “Salome”. Autographed postcard signed "Richard u. Pauline Strauss". 1p., 5.5 x 3.5 inch, Amsterdam, 1904, October 5 (from postmark). Addressed to German arts patron Willy Levin and wife in Berlin. In German, translated: "This evening, first concert with (Symphonia) Domestica and songs. See you again soon!” Inscribed in the margins of a view of Bocht Heerengracht in Amsterdam and addressed on the verso in his hand. Faint scattered soiling, cancelled 5-cent stamp at upper right verso. Composer, pianist, and conductor. Widely considered one of the most important and influential composers of the 20th century. Wonderful signed portrait “Igor Stravinsky”. Program, 12 pages (recto and verso), 8.25 x 9.25 inch, Concert program for the gala concert “Musica Viva”, 1957 October 4, German Museum Munich. Signed inside the program in blue ballpoint pen. Fine condition. Italian composer of operas. Autographed letter signed “G. Verdi”. 1p., 5.5 x 8.5 inch. Torino, 1861 November 26. To his lawyer Ercolano Balestra in Parma. Blind embossed coat of arms at the top - “Camera dei Deputati” of the first Italian Parliament, to which Verdi belonged as a member. Written before his departure to St. Petersburg for the performance of his new opera „La forza del destino“ In Italian: “Avrei voluto parlargli prima di partire, ma non ho avuto tempo di venire a Parma… Glimando 20 Nap. d’oro… Di fretta le dico addio a rivederci in Marzo se non gelerò. Mi scriva con qust indirizzo/ Monsieur Verdi/ au Théatre Italien/ Russie/ St. Petersbourg”. Mailing folds, slightly discolored, minor stains, else good condition. La forza del destino (The Power of Fate or often translated The Force of Destiny) is a Italian opera by Verdi and was first performed in the Bolshoi Kamenny Theatre of Saint Petersburg, Russia, on 10 November 1862. German composer, theatre director and conductor who is primarily known for his operas especially “The Ring of the Nibelung”. Autographed letter signed “Rich Wagner”. 1p. (double sheet), 5.5 x 8.5 inch. Bayreuth, 1877, December 11. 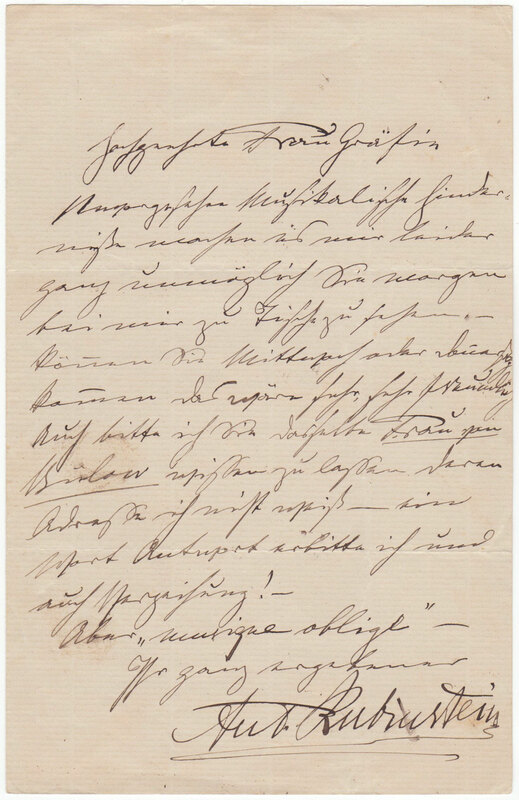 A letter to G. Steckner in Leipzig. In German, translated: “Dear Sir, we are satisfied with the five colour samples which we return herewith, but we still lack the sixth shade mentioned, that is the noticeably darker shade corresponding to the enclosed 539, which is included on the sample card as “chartreuse” with a number which was quoted to you. 539 would be of no use to us without this further, darker shade, and so we ask you to complete the first consignment. We expect the promised delivery of the stated quantities by the date mentioned by you, and the two whole consignments which are to be ordered within 3 or 4 weeks. Yours most respectfully”. Mailing folds, slightly discolored, minor mounting residue on verso, else good condition. German-born conductor, pianist and composer. Signed and inscribed photograph “Für Karoline Schnobel mit bestem Gruss Bruno Walter” and dated in his hand “September 1958”. 4.5 x 6.5 inch, n.p. Excellent black and white photo in fine condition. German-born conductor, pianist and composer. Christmas card signed “Bruno Walter”. 4.5 x 5.75 inch (folded), n.p., n.d. Additional salutation in Walter’s hand “Auf Wiedersehen in Salzburg! Ihr altergebener“. Written and signed in ballpoint-pen on verso. Inside the card is a print of a Madonna with child. Slightly trimmed, else good condition.